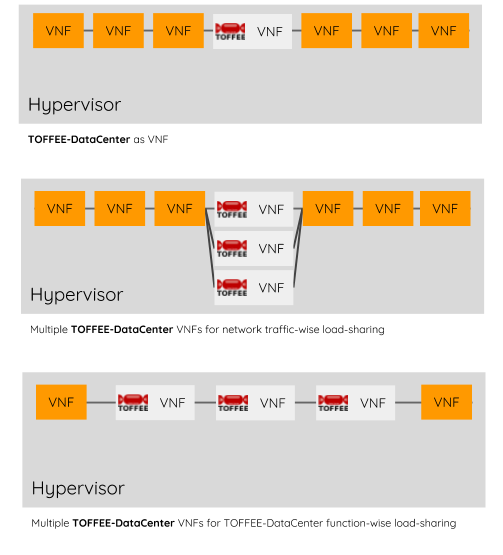 TOFFEE-DataCenter as a VNF for NFV: You can deploy it as a VNF within your overall NFV/SDN infrastructure as shown below. Besides TOFFEE-DataCenter can also be customized to perform load-sharing for high-bandwidth high-speed WAN network traffic-wise with multiple TOFFEE-DataCenter NFVs. The advantage of this approach is that it needs least amount of customization of existing TOFFEE-DataCenter modules. Or you can do TOFFEE-DataCenter internal module-wise load-sharing with multiple TOFFEE-DataCenter NFVs. But this approach needs deep internal architectural level (and source-code) customization.